A custom crest is a fun and special way to add personality and meaning to your wedding day or event! This is a super popular trend right now and we love getting to work with clients of all kinds to come up with unique designs. Today we’re sharing a little behind the scenes about our custom crest design process. We’re going to walk you through our steps from concept to creation from a recent project with a local couple, Amy Kate and Chris. 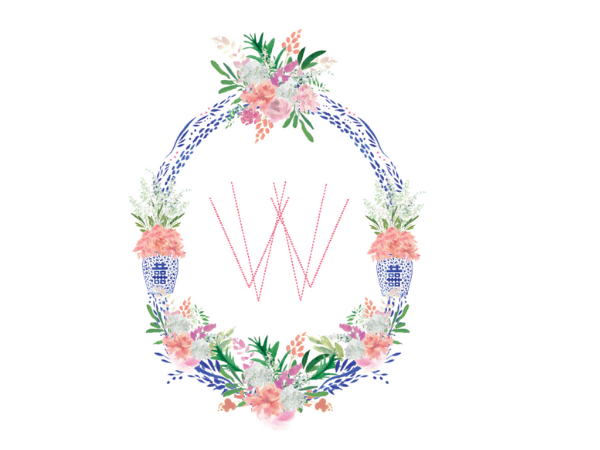 Amy Kate reached out in search of a vibrant and fun crest for their small family wedding this spring here in Nashville at Henrietta Red. Our first step after an initial inquiry is to dig a little deeper into the vision and inspiration for the design. 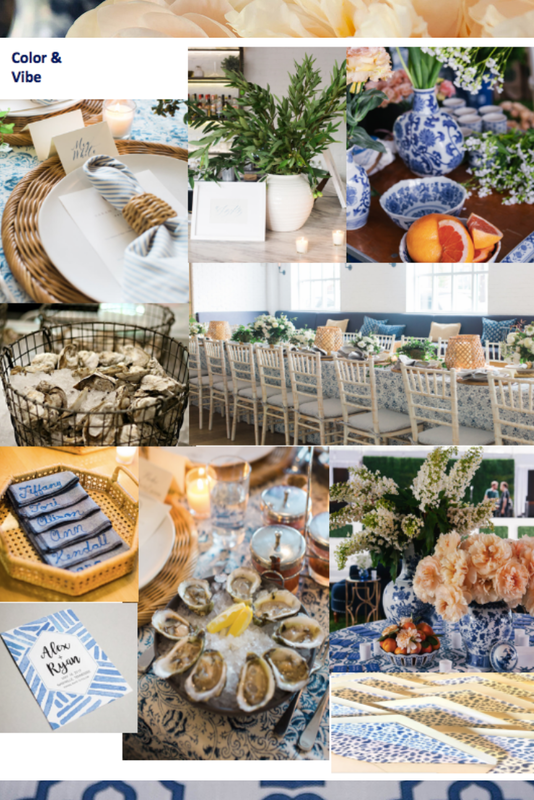 We asked Amy Kate for more information about her vision and overall theme for her wedding and what she’d like to see incorporated into the design. The design above brings in the key elements from Amy Kate’s wish-list: Ginger jars with bold florals, vibrant colors and pattern play. While this design is beautiful and fun it was still a few steps away from being exactly what Amy Kate and Chris envisioned. The next step is editing + revisions. 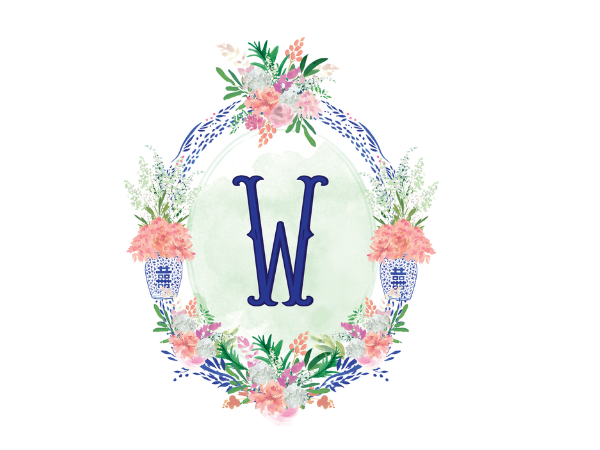 Amy Kate and Chris loved the initial design but wanted to tweak it by enlarging the floral details + ginger jars, changing the monogram letter style and adding a pop of color in the center to lessen the white space. This version with the green background ended up being the best and final version! Amy Kate and Chris loved the fluidity and imperfect shading of the green watercolor background. After finalizing the design they received their final files in PDF, PNG and JPEG format so they can use the crest on anything their heart desires. Hopefully you’ve enjoyed seeing the behind the scenes of this custom design! Our goal is to make the custom process as fun as possible and we love being able to collaborate and make edits to make sure it is 100% the way you want. Are you interested in a custom piece? Get in touch via our contact form or send an email to info@primprettyprints.com and we’d love to discuss further with you! and timelines of communication regarding edits. How customizable is the design? Each piece of the crest is painted individually and then is digitally put together on the computer, making it easy to add or remove anything you like/don't like. A custom crest is based on the scope of work involved. A crest starts at $200 and goes up in price based on how many intricate custom elements are required. Your purchase includes your crest in PDF, PNG and JPEG file types which should cover your needs when adding your crest to various items (cookies, bags, favor tags, koozies, etc.) If you need an additional file type that is no problem at all!